Halloween is celebrated in Antioch, IL in a BIG way . . . Treat the Streets (trick or treating) among Downtown Participating Business from Noon till 2 pm. Monster Mash Bash (at the Bandshell) incudes Weiner Races (1:30 pm); Pumpkin Roll (2:30 pm); Costume Contest (3:15 pm); plus Games which benefit Open Arms. For information about various activites, please call the Village of Antioch's Parks Department at 847-395-2160. Click HERE for a printable event flyer. Treat the Streets take place at participating Businesses in Downtown Antioch, IL. 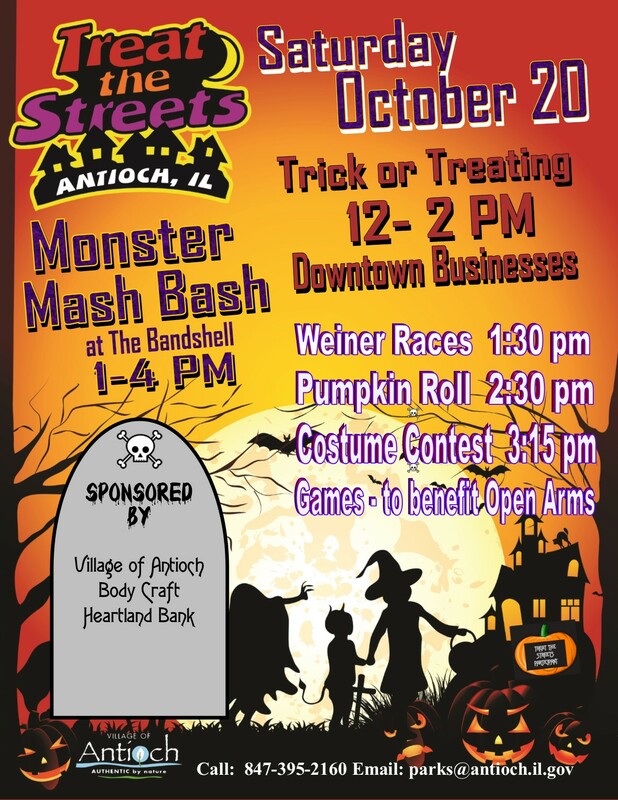 The Monster Mash Bash (with other activities) takes place at the Antioch Bandshell from 1-4 pm.